Wondered when the fleetwide chat would be held? Wonder no more! Mark your calendars for the second Sunday of every month at 1 PM EST. You’ll receive plenty of updates from us, too, so never fear again that you’ll miss a chat! What are the fleetwide chats? 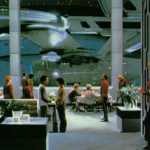 They’re a space for all the members of the Starbase 118 group to get together and talk in real time about everything that’s happening within the group. Come by and see what goings-on are happening off your ship! If you have problems connecting, use the instructions listed below the chat box.